Le Gray was born in 1820 near Paris and trained there as a painter. Around 1847 he took up photography. Even before making the marine images, he became one of the most renowned pioneers of the new art. His architectural, landscape and portrait photographs, his writings, teaching and inventions were all highly influential. However, in 1860, despite his success, he became bankrupt. Abruptly he abandoned his business and his family and left Paris for Italy. He finally settled in Egypt to become a drawing instructor, though he continued to take photographs, and died there in 1882. "From the midst of this ‘pother’ of dimness falls a gush of liquid light, full and flush on the sea, where it leaves a glow of glory…It is as when Jacob’s ladder of angels was just withdrawn, and the radiance above and below, where it rested on earth and sky, had not yet melted out." Absent from the scene in Solar Effect in the Clouds – Ocean are the boats, heavy waves or any sign of humanity. The viewer is left in confrontation with the sea and potentially threatening clouds. The Brig was Le Gray’s first exhibited seascape and his most highly praised. Its appeal derives largely from the poignancy of the little ship seen alone against an immensity of sea and sky. In the 1850s and 1860s this was probably the most famous photographic image in Europe. It may also be the first example of a photograph conceived as fine art to achieve both commercial success and critical admiration. The London photographic dealers Murray & Heath reported 800 prints being ordered within the first two months of it being offered for sale. To facilitate printing of such numbers, copy negatives of the original image were made. 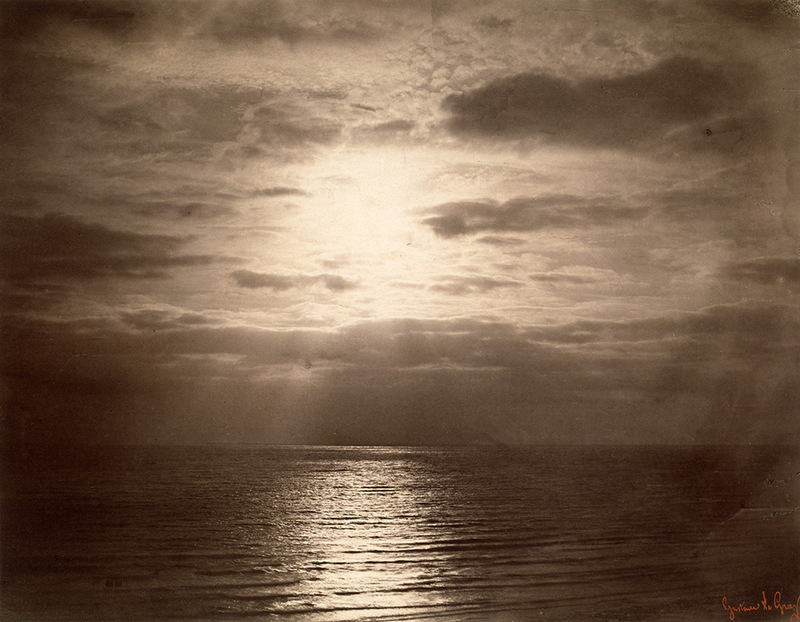 Le Gray shot directly into the sun for the photograph The Sun at its Zenith in an attempt to balance on one glass negative the exposure for a bright sky and a relatively dark sea. The sun has become a dark disc, due to a photochemical phenomenon in which extreme over-exposure at an intense point of light reverses the tones on the negative. 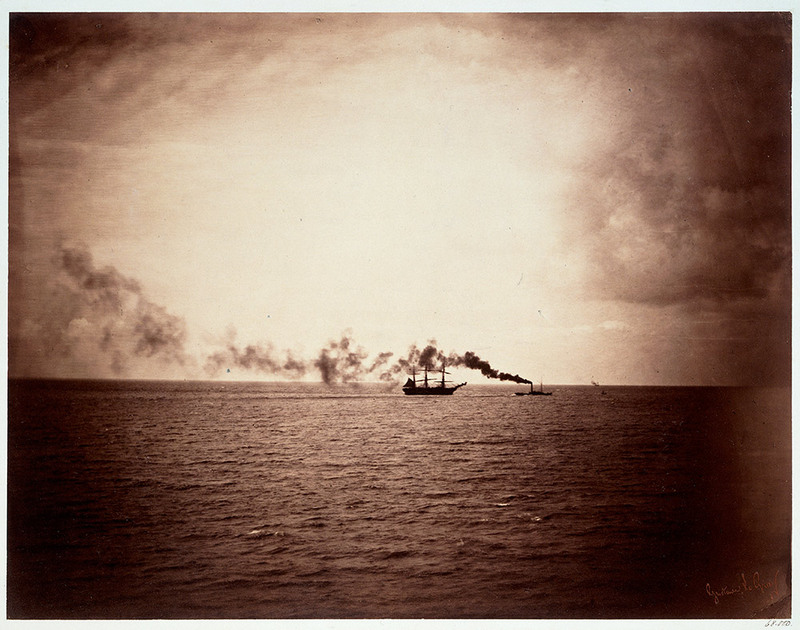 In the image The Tugboat the atmospheric cloud forms are echoed by a dark plume of smoke coming from a steam-powered tug boat. Behind it trails a sailing ship. Whether the tug is pulling or overtaking the ship, the comparison between the two vessels is striking. The suggestion is that the traditional is literally overtaken by the modern. The forms on the horizon stand out in silhouette, or contre jour – a French term used by artists to mean literally ‘against the day’. 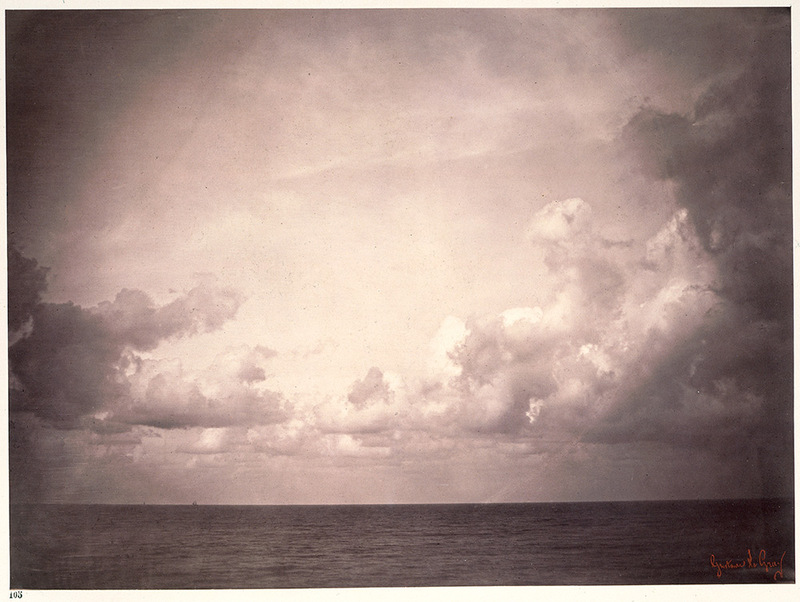 Despite its title, the image Seascape with Cloud Study shows almost no sea and is more of a cloud study, concentrating upon the massive, billowing formations. In its extreme economy of compositional elements The Steamboat is unique among Le Gray’s seascapes. 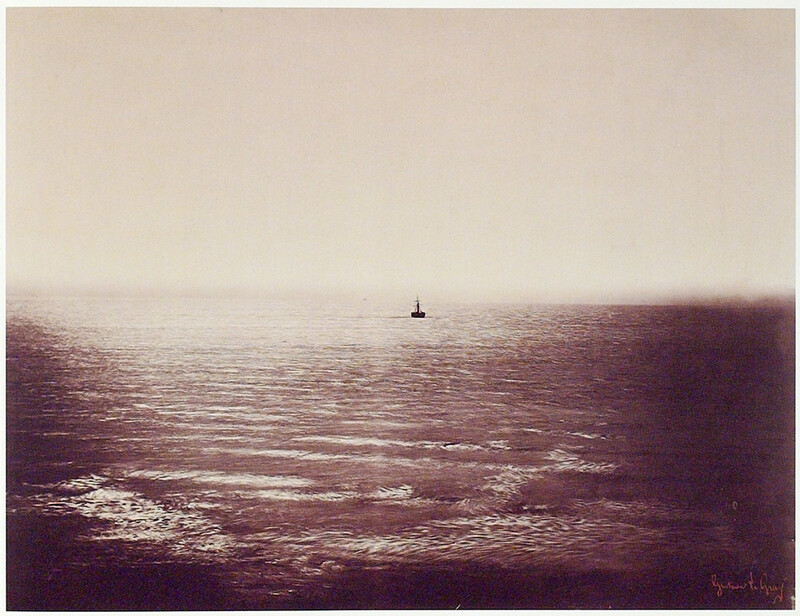 The lack of clouds, and the horizon blurred by sea mist, creates an environment in which the small vessel at the precise centre seems to sail into the unknown. Comparing this scene with his more visually dense seascapes suggests that Le Gray conceived of the set as a suite of contrasting images, each with a different emotional impact. He knew when to apply the drama of a turbulent sky and could easily have added one here from a second negative, as he had done elsewhere. Yet he preferred to leave it barren to enhance the feeling of isolation and vulnerability. The seascapes were, and are still, Le Gray’s greatest public, commercial and aesthetic success. He took them in France – a first set taken in Normandy in the summer of 1856 and a second set from the Mediterranean coast in spring 1857. It was not only their beauty that attracted high praise but also Le Gray’s technical mastery in capturing apparently instantaneous views. To arrest breaking waves was an impressive accomplishment at a period when exposures required many seconds rather than split seconds. Most photographers found it impossible to achieve proper exposure for both landscape and sky in a single picture. This usually meant sacrificing the sky, which was then over-exposed. 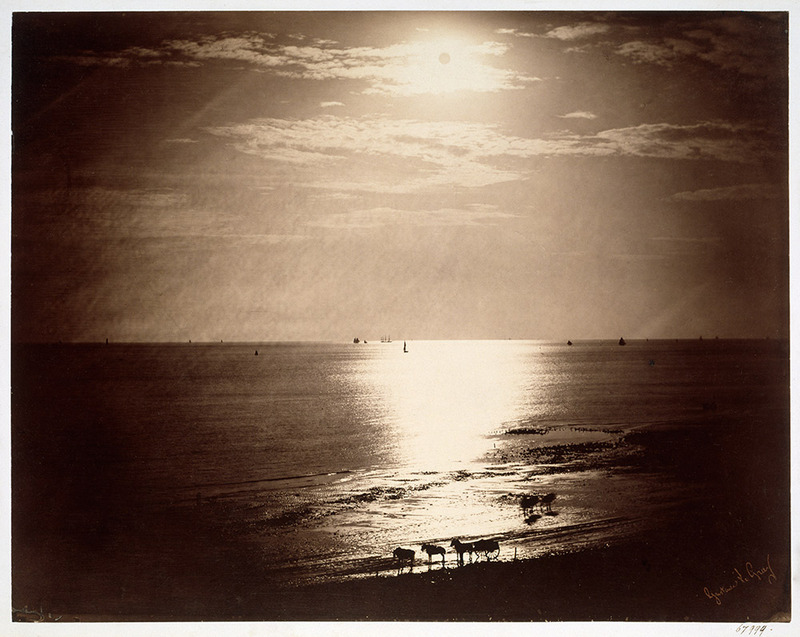 Le Gray’s innovation was to print some of the seascapes from two separate negatives – one exposed for the sea, the other for the sky – on a single sheet of paper. Le Gray’s glass negatives were the same size as his photographs – about 32 x 42 cm (12 ½ x 16 ½ ins). He placed the negative directly on top of the photographic paper and printed in sunlight. The prints were then toned in a solution of gold chloride in hydrochloric acid. This resulted in a rich, violet-purple colour, with the added benefit of stabilising the images to help them withstand fading over time. Collodion-on-glass negatives were introduced in 1851. Le Gray adopted them in preference to paper negatives to achieve maximum sharpness coupled with even faster exposure times. The glass plate was covered with a solution of ether and guncotton (cotton steeped in nitric and sulphuric acids). It was then sensitised. The negative had to be exposed in the camera while still wet and developed immediately afterwards. In his writing, Le Gray set out a ‘theory of sacrifices’. This suggested that in a work of art detail could be sacrificed in the interests of the overall impression of light and shade. Here he illustrates that theory using the most ethereal subject matter. Throughout his career, and especially with his marine images, Le Gray rose to this challenge. To unite the seascapes compositionally, Le Gray created a framework of horizontal zones, with few constraining borders. Within this, he explored the potential of the subject, from empty skies and calm waters to brooding cloudscapes and turbulent waves. He enlivened the scenes with figures, jetties, beaches and seagoing vessels. With these simple notes, he composed a series of images that are breathtaking in their subtlety and symphonic grandeur. ‘Macaire’s instantaneous photographs of the sea that were published some years ago by Le Gray which so astonished the photographic world’. However, little is known about the photographer Cyrus Macaire to whom this article probably refers. The possibility that Le Gray acted as a publisher for other photographers is feasible. If true, the suggestion does not undermine Le Gray’s artistic judgement, high standards of printing and entrepreneurial skill. Some experts do not subscribe to the idea and opinion is currently divided. Most of the V&A’s fine group of Le Gray seascapes came to the Museum in 1868 as part of the bequest of the millionaire art collector Chauncy Hare Townshend. He had kept them in portfolios along with his watercolours, etchings and engravings. They have therefore remained in excellent condition, preserved to museum standards almost since they were made. Three other seascapes arrived at the V&A in 2000 as part of a transfer of photographs from the British Museum where they were acquired in 1857. All of the prints have therefore remained in excellent condition, preserved to museum standards almost since they were made. 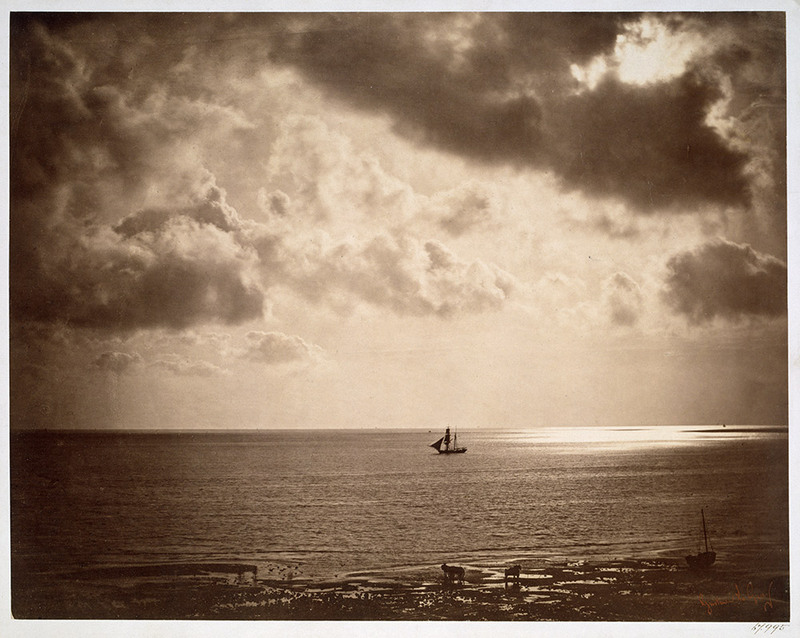 This text was originally written to accompany the exhibition Sea and Sky: Photographs by Gustave Le Gray 1856-1857 on display at the V&A South Kensington between 8 May and 3 August 2003.